Are you struggling with headaches, fatigue, weight gain, joint pains or an autoimmune disease? Have you explored numerous options and not found the relief you were hoping for? 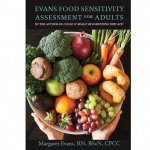 My new Evans Food Sensitivity Assessment Tool (EFSAT) might offer the answers you are seeking. Food Sensitivities can play an important role in symptoms affecting a wide range of body systems. 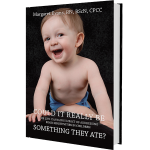 The food that is responsible is most often the result of a food intolerance and not a food allergy so traditional blood and skin tests are of no help. The Evans Food Sensitivity Assessment Tool enables you to quickly, accurately, and inexpensively determine the role that food might be playing in your health. It will help you look at the symptoms you have experienced throughout your lifetime and will accurately identify the offender. It also guides you through a short process to help you plan ahead so you achieve successful, sustainable change in your diet. If you are sick and tired of being sick and tired, take the step now to order my assessment and begin on a journey to feel better.